With business dropping off in WWF in the early 1990’s, due mostly to waning interest, as well as public loss of favorability thanks to the steroid allegations, Vince McMahon wasn’t willing to rest on his laurels and accept a slide into pop culture obscurity. Instead, since he had originally booked the 100,000 seat Los Angeles Coliseum for WrestleMania VII, he needed to find a way to fill a venue that would surpass the record crowd in Pontiac, Michigan from four years prior. Logic seems to dictate that a rematch with WWF Champion The Ultimate Warrior and the man he felled one year before to claim the championship, Hulk Hogan, would be the right course of action. There’s a ready-made draw for the match as well: Hogan wins the 1991 Royal Rumble, challenges Warrior, Warrior says “I already beat you, so forget it”, and Hogan puts his career on the line as collateral, making Warrior accept. Intriguing, no? Hogan’s hypothetical swan song might have sold out the Coliseum. At least, it had a better chance than what McMahon actually did go with. With conflict in the Persian Gulf, WWF made over longtime patriot Sgt Slaughter into a disgusting Iraqi sympathizer, aligning him with Saddam Hussein in an attempt to push the jingoistic buttons of every American fan watching. The goal: have Hogan defend the honor of America by taking down the fascistic sadist known as Slaughter, and restore America’s dignity. Slaughter defeated Warrior for the championship at the Royal Rumble, and the idea of Hogan-Slaughter headlining WrestleMania VII did little for ticket sales. By mid-February, only 20,000 seats had been sold. After winning the championship in January 1991, Slaughter stepped up his ludicrous façade of hating America. Slaughter won the belt four days after Iraq was to have pulled out of Kuwait, a deadline set by then US President George H.W. Bush, so patriotic fervor was running high. 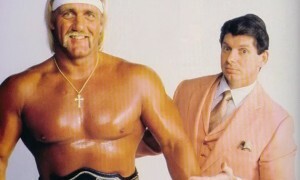 With the very real possibility of young Americans (not to mention soldiers from other nations, but merely giving an American perspective) going off to war in order to liberate Kuwait, it was astonishing that the WWF was cashing in by wanting to have Slaughter burn the American flag (which he refused to do), but settled instead for having him set fire to Hulk Hogan merchandise. The build continued, with Hogan spouting American aphorisms and clutching to Americana like heroes of folklore, while Slaughter threatened to take the championship back to Baghdad, in order to present it to his hero, Saddam Hussein. The WWF made the decision to move the event indoors to the much smaller Los Angeles Sports Arena, with the official reason involving security concerns. Slaughter was, allegedly, the target of several death threats over his character, although the horrid ticket sales were likely a big reason as well. While the Ultimate Warrior would not be main eventing, he was given quite the interesting match-up to work with. Macho King Randy Savage had cost Warrior the championship at the Royal Rumble, after Warrior refused to grant Savage a shot, and now the two were pitted head to head. But the match wouldn’t just be any old encounter; instead, it would be a “Career Ending” match, in which the loser would have to retire. The WWF was no longer big enough for both of their explosive personalities, and the build made up for the lack of intrigue from the Hogan-Slaughter contest. Also on the card, The Million Dollar Man Ted Dibiase would tangle with his ex-bodyguard of over three years, Virgil. Virgil, after months of increased humiliation at his boss’ hands, turned on him at the Royal Rumble. Rowdy Roddy Piper, proud of Virgil for his showing of pride, offered to train him in an attempt to defeat Dibiase and embarrass the snobby villain. The Big Bossman had a chance to complete a gauntlet AND win a championship. After months of verbal abuse from Bobby “The Brain” Heenan, who frequently insulted his mother, Bossman began to run through Heenan’s “Family” of wrestlers, before getting to the crown jewel, WWF Intercontinental Champion Mr. Perfect. A win would give Bossman personal satisfaction, and championship gold, while shutting Heenan up for good. Also on the line, the WWF World Tag Team Championship, as The Hart Foundation would be defending against The Nasty Boys, who’d won the right to challenge weeks before by winning a seven team battle royal. The Harts wouldn’t go down without a fight, but a loss might do wonders for one member of the team. In addition to all of this, a certain superstar made his WrestleMania debut at this event, and let’s just say it was win #1 in his long streak. Gorilla Monsoon and Bobby Heenan called the action, with guest commentators filling in for when Heenan had to manage. Willie Nelson sang the Star Spangled Banner, and celebrities Regis Philbin, Alex Trebek, and Marla Maples were on hand as well. For the first time in the annals of WrestleMania, a match in the middle of the show completely overshadowed the main event. Sure, WrestleMania III had Ricky Steamboat and Randy Savage delivering a classic, but at least Hulk Hogan and Andre the Giant created an immortal moment. Other than Hogan’s on-camera forehead butchering, not many fans recall this main event with great detail. WrestleMania VII was not a bad show by any means. Rather, it’s a show with a number of great matches, but leaves a rather sour taste in your mouth with the exploitation of the Gulf War. The conflict in the Gulf was largely settled by the time the show took place, and Hussein’s army was simply no match for the opposition. To have Slaughter go on television and declare such a paltry regime to be so great only served to make him look foolish, and it didn’t make for an enticing attraction for wrestling’s biggest annual show. WrestleMania VII will be remembered just as much for the tearful reunion that took place in the middle of the card, as it will be for the vile inducing of xenophobia that the main event was supposed to bring out.